I'm completely with you there, design-philosophy-wise. Racial options should build on races, everything else is fluff and shouldn't fracture into requirements - It's one of my personal pet-peeves, as are races that gear a character too strongly towards a given profession, via e.g. +4 bonus to a mental attribute and two -2s on physical attributes. I hate those races. And while I'm not a fan of the ARG - at all - I really like what you've done with totems and constellations: It keeps the spirit (pardon the pun) alive while still offering better flexibility. So mechanically two thumbs up and kudos! I'm looking forward to book 2! Personally, I don't mind the only brief histories for most of them. It takes a while to write materials & all. Anywayz. Bought volume 1 both hard copy & PDF(a rare thing for me to do). It left me wanting. Definitely looking forward to volume 2. Overall, I like the toning down the power in some areas & stepping it up in others. It brings a nice middle ground to Tome of Magic the Secrets of Pact Magic serieseseseses. Making pact magic variants for core classes was definitely a good way to integrate it. I don't mind the limit of pact spirits known. I do, however, see some issues with not having clearly defined ways to research new spirits. I really hope this gets addressed in the 2nd book. It's kind of a big deal. I hate to say it, but its more about page count than materials. The book came down to about five pages, and we made the call to add five more spirits over five more legends. Was it the right call? Debatable, but we have noted the demand for more of Dario's excellent Legends. I agree that this is a big deal, and it will be addressed in Volume 2, which has a "Skills and Feats" Chapter in order to get those rules in. As a quick preview, the basic idea is that you have to succeed at four specific "Knowledge Tasks" in order to unlock a spirit. Each Knowledge is associated with a specific aspect of the spirit; there is a Knowledge check to discover the seal, a check to discover the ceremony, so on and so forth. The first check is hard, but as you uncover more lore subsequent checks become easier as you slowly figure out what it is your looking for. The system also allows the GM to "throw you a bone," so to speak and gift you with one or more Knowledge tasks in varying ways, such as discovering an unknown spirit's seal written in blood on the floor of a forgotten house. In addition, Volume 2 will have new magic items tailored to Pact Magic. One of them is called a Gnostic Tome, which is a somewhat expensive book that can fully teach a character all four Knowledge tasks of a specific spirit. When is volume 2 schedule to come out? When the Stars Are Right. Joking aside, Dario and I are hoping to have it done soon. We've had a few stumbling blocks, but our editor is working hard and fixing every stupid misspelling that I'm sure I accidentally put into that document! How many preexisting spirits will be converted for this one? The biggest problem I have with implementing the current rules in my game is that there aren't really enough binding options yet (to my mind, ymmv). My current outlines have the total number of spirits sitting at 120 by Volume 3, not including any products outside of the Pact Magic Unbound line that we release (maybe). I'm not ready to talk more about Volume 3, however. Dario and I are still trying to figure out if we could feasibly break into the 3PP scene like some of the other publishers; if we do, all bets are off with these spirit number estimates ;-). Baby steps, EML! Baby steps! I've just got into this and I must say I do enjoy the possibilities it brings. I do have a question (and may very well have more later). When an archetype says it binds spirits as an occultist of the same level, does that include the ability to bind multiple spirits? Edit: When an archetype says "unaligned" spirits in an area talking about choosing a constellation it means "spirit not aligned to that constellation" not "spirit without a constellation", right? 1) No. "Bind Additional Spirits" is a class feature and not part of the binder level rules. It is similar to how many classes say, "You qualify for feats as a fighter of the same level ..." but you wouldn't expect to gain bonus feats like a fighter for having an effective fighter level. 2)You're correct. Unaligned spirits refers to spirits that are not aligned to your constellation. For example, if you were to align to the Angel constellation, then you would be barred from the Fiend constellation (its opposed constellation) and your binder level would be treated as 1/2 for all spirits that do not belong to the Angel constellation (spirits unaligned to Angel). And this, my Facebook Group Friends, is why I came up with the title "Starless Spirits" instead of using "unaligned spirits" when talking about spirits that do not belong to a Constellation! If you have no idea what I'm talking about, check out the Pact Magic Facebook group. Optional penalties include loosing half your totem bonus if you are the favored enemy. 1) No, being a spirit's Favored Ally has no benefits if you do not receive a totem bonus on your binding check from said spirit. Likewise, being a Favored Enemy has no real penalty; you just reduce the bonus that having a totem would have given you. 2) Most spirits specifically exclude Favored Allies from their Favored Enemies. Since I didn't write a rule for something like that into the book, its up to your GM what happens. I would personally just have the two cancel each other out, because the alternative is that being a Favored Enemy is more important than being a Favored Ally. But totally up to your GM and how he / she wishes spirits to act in his / her campaign world. I am currently working on erratas and FAQs for this book. If you have any questions or you've noticed some wordage that doesn't make sense, please either post it here in this thread or post it in the FAQ Thread that I've started in the 3PP Forum. So, Dagon's favored ally is Aberrations but his favored enemies are aquatic and *any* humanoid. So, if you're a humanoid aberration, making you both a favored ally & a favored enemy, what happens when you use the Dagon Knows ability? It is impossible to be of the humanoid type and the aberration type at the same time. That said, whenever you qualify as both a favored enemy and favored ally at the same time, the two conditions cancel each other out; you receive no benefits and no penalties. This is not a rule in the book however, and as always your GM can rule otherwise as she sees fit. Here's my question: I already own Secrets of Pact Magic and Villains of Pact Magic for 3.5, along with the Pathfinder conversion document. 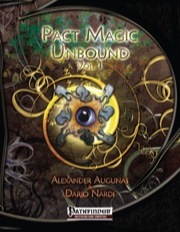 Why should I also buy Pact Magic Unbound? This question was originally posted in our FAQ thread. I am answering it here to keep the focus of that thread on the FAQs. Before I answer this question, I'm going to point you to Endzeitgeist's review of our product here. Okay, why should you upgrade? Well, to put it bluntly the design philosophy between Secrets of Pact Magic and Pact Magic Unbound, Vol. 1 is 100% different. 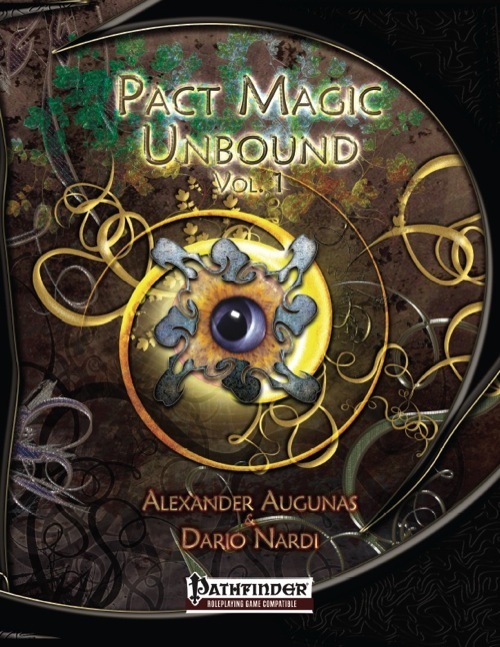 Each book is a product of its time, if you catch my drift, and rather than simply updating every spirit with Dario's original conversion document, Pact Magic Unbound has been completely rebuilt from the ground up. When writing the book, the only thing I didn't write are the expanded Legends that Dario and I chose to reprint in this book. So you might get 10 pages of reprinted material if you buy the book; everything else is brand-new and remastered. The spirits and abilities have a much more standardized system of balance. When designing the spirits, I wanted to make sure that every spirit was viable at every level of play; this was especially important because Dario and I knew we couldn't hope to get every spirit from both books updated in Pact Magic Unbound, Vol. 1 Along this line there are no more "requirements" to bind spirits; instead it becomes easier to seal pacts with spirits as you meet certain criteria. Instead of introducing a hundred classes, this book only offers one new class, the Occultist, and instead creates archetypes and similar options for all of the Core Classes. The Foe Reaper from Secrets of Pact Magic is now a Ranger archetype, the Soulweaver is now a Wizard archetype, and the Empyrean Monk is now a Monk archetype called the Empyrean Friar. In order to meet our goals, new archetypes were created as appropriate, including Ravaged and Ergon bloodlines for the Sorcerer, the Untouchable rogue, and the Totemic Sage barbarian. Because the majority of my designing background is for Pathfinder, I've added options that fit with all of the hardcovers that were out when this book was released; you'll find a bardic masterpiece, an Occult Domain, an Oathbound Paladin oath, and new rage powers and rogue talents. If none of my idealistic blabbing has convinced you, all of our rules content from this book has been added to the PFSRD website; search for our class archetypes under the Radiance House publisher or simply search for terms like "occultist" or "pact magic." You can determine if this is the product for you using those samples. As someone who's been doing pact magic characters since Tome of Magic(aka, the only part of that book that was good instead of unplayable garbage), I can safely say, that the new stuff's solid enough, though one will find'emself looking forward to the next volume. It's rare for me to buy physical copies of books, but I did so on faith & don't regret it. But, yeah, just thought I'd ask on that to be sure. Some people I've played under have strange ideas of what "logic" is. I hear that on weird rulings, which is why I'm making the errata. For example, if you do the math, being both Favored Ally and Favored Enemy wouldn't actually cancel each other out; you'd be forced to round down and being the Favored Ally would give way to the Favored Enemy. Sort of a pessimistic view! Alternatively, it could result is a 50/50. Or those people destroying your stuff to obstruct your attempts to recover parts of an ancient artifact without trying to talk to you first aren't your enemies and actually trying to help you in your quest. It's amazing how different 2 people can interpret the same thing. This is the current list of Errata that I am planning on sending over to Dario in roughly one week. Until then, you're free to comment on the errata and offer your insight and opinions; I will take all constructive suggestions into considerations into account when finalizing the erratas. Please quote the specific errata that you are referring to when replying. This is an error; every other section of the book refers to the correct formula. » At 20th level, an occultist augments his soul with the essence of the spirit realm. When he or she makes a good pact with a spirit, that spirit’s granted abilities continue to function within an antimagic zone unless the spell’s caster level or CR is greater than the occultist’s binder level. In addition, an occultist can ready a spirit’s major granted ability as a free action, allowing it to be used even if it was previously expended. This ability can be used once daily per spirit the occultist is bound to, to a maximum number of times each day equal to his Charisma modifier (minimum 1). The original version incorrectly referred to "exhaustion" instead of "expended." Older versions of the book referred to exhaustion until it was pointed out by a playtester that it sounded too much like the exhausted condition. » As a standard action, you create a berry that heals 1d4 points of damage when consumed. You can create a number of berries each day equal to your occultist level. » You gain a +4 bonus to your CMD against bull rush and trip combat maneuvers for 1 round as an immediate action. Your speed is halved while you receive this benefit. In the first change, the reference to goodberry was dropped because it was confusing. In the second change, the ability was buffed slightly and the wording was fixed to make it clearer how it worked. » After empowering a major ability, it is expended for double the usual number of rounds (10 rounds for most abilities, 8 if you have a special feat or ability that reduces the number of rounds it is expended for). This ability incorrectly referred to "exhaustion." » (10 rounds for more abilities, or 8 if you have a special feat or ability that reduces the number of rounds it is expended for). » Add half of your occultist level (minimum 1) on all Knowledge (arcana) and Knowledge (planes) checks that you make. No real change here except the wordage was cleaned up. — Add “(Su)” after Improved Totemic Alignment and Totemic Mettle. This ability is incorrectly labelled as an extraordinary ability. Correcting incorrectly referenced rage power names. » You experience this information in real time and you only gain information that the creature possessed, so if it was stabbed from behind and never saw its attacker, then this spell does not reveal the attacker’s identity to you. This was incorrectly omitted from the spell's entry. » At 1st level, the pactsworn pagan aligns with either the Beast, Dragon, Scholar, Seer, or Tree constellation. The pactsworn pagan cannot seal pacts with spirits whose constellation opposes the aligned constellation. Also, the pactsworn pagan is treated as a binder of ½ his or her druid level when making binding checks with unaligned spirits. Constellation Alignment is being streamlined; several classes had different abilities with the same name with different effects. Constellation alignment now reduces your binder level when making binding checks with unaligned spirits (spirits that don't belong to his aligned constellation). This only applies on binding checks and is a buff to many of the core class archetypes. » At 1st level, a warshade aligns with one constellation. The warshade cannot seal pacts with a spirit whose constellation opposes the aligned constellation. Also, a warshade is treated as a binder of ½ his or her fighter level when making binding checks with unaligned spirits. — Delete sentences 4 and 5 in the first paragraph. The empyrean friar suffered from copy/paste syndrome with the pactsworn pagan. » Also, the empyrean friar is treated as a binder of ½ his or her monk level when making binding checks with unaligned spirits. — This ability should replace quivering palm. As printed, the archetype trades timeless body twice. This was an error and Favored Spirit is intended to trade quivering palm. » Also, the foe reaper is treated as a binder of ½ his or her ranger level when making binding checks with unaligned spirits. » A foe reaper does not select his or her favored enemies as a standard ranger does. Instead a foe reaper treats all creatures that qualify as the favored enemy of spirits that she is bound to as her favored enemy. The foe reaper’s favored enemy bonuses improve at the same rate as the standard ranger’s bonuses and this ability counts as a ranger’s favored enemy for all purposes, including feats, spells, and other prerequisites. This ability modifies the standard ranger’s favored enemy. This ability was reworded for clarity. » At 13th level, a foe reaper can ready a spirit’s major granted ability as a free action by spending all of the points in his or her ki pool (minimum 3), allowing it to be used even if it was expended. This ability replaces the favored terrain gained at 13th level. This ability was reworded for clarity. It also incorrectly referred to "exhaustion." » A warshade who selects this feat gains access to a spirit’s major granted ability if he or she succeeds on its binding check by 5 or more. If a warshade exceeds the spirit’s binding check by 15 or more, he gains the spirit’s capstone empowerment. This effect replaces this feat’s usual benefit. » You can bind one constellation aspect to a spirit, as the occultist class feature. An occultist who selects this feat can bind one additional constellation aspect to a single spirit that he or she has sealed a good pact with of his or her choice. As written, anyone is allowed to take this feat but only occultists (and rogues with the Constellation Aspect talent) actually benefited from it. This was fixed to allow intended usage. » After the spirit leaves, it refuses to answer your summons for 24 hours. » Using a major granted ability in this way expends it. » While bound to a spirit, reduce the number of rounds that the spirit’s granted abilities are expended for by 1 round, down to 4 rounds for most abilities. This feat does not reduce an ability’s expenditure if it is expended by any means other than using it, such as through disruption (see Exorcise Spirits, above) or by expending them to power another feat or ability (such as the Furious Strike feat). This ability incorrectly referred to exhaustion. » You can apply the Rapid Recovery feat to major rewoven spells as if they were the spirit’s major granted ability. Like Rapid Recovery this feat does not reduce the number of rounds a rewoven spell is expended for if it is expended by means other than using it. » You cannot reduce the number of rounds that a rewoven spell is expended for. This ability incorrectly referred to "exhaustion". — Remove the first sentence. In a previous build, you were immune to Sevnoir's Major Granted Ability for 24 hours if you succeeded on your Will save. This sentence is vestigial for this reason. » You can charge double the normal distance and gain the benefits of the Run feat. Spirits were never intended to actually give you feats for the purpose of qualifying for prerequisites and the like; this wording is an update to reflect the ability's intended meaning. » You gain proficiency with longbows and shortbows as well as the benefits of the Precise Shot feat for the duration of the pact. » You gain the benefits of the Power Attack and Vital Strike feats for the duration of the pact. » Your paintings last until your pact with Muse Istago ends or until they are dismissed as a free action. You may only have one painting active at once. Minor granted abilities lasting for 24 hours "or the duration of the pact" was confusing when combined with the reduce effect of Flexible Pactmaking. All such granted abilities were errata'd to only last for the duration of the pact in order to align with their intended function. — Remove the extra parenthesis at the end of the second totem. — Remove the words “24 hours or” from this entry. » You gain the benefits of the Awesome Blow feat for the duration of the pact. See the feats section in PATHFINDER ROLEPLAYING GAME BESTIARY. » You gain the benefits of the Command Undead feat. You do not need to expend uses of channel energy to use this ability and your cleric level is equal to your binder level when using it. This benefit stacks with any cleric levels you possess, up to your character level. If an undead succeeds on its Will save against this ability, it is immune to it for 24 hours. Cleaned up for clarity and because spirits were never intended to actually give you feats for the purpose of qualifying for prerequisites and the like; this wording is an update to reflect the ability's intended meaning. » You gain the benefits of the Diehard feat except you are not staggered or disabled when using this ability. Furthermore, strenuous activity while at 0 or fewer hit points does not cause you to suffer hit point damage and you do not die until your negative hit points equal double your Constitution score. » When you teleport using geometrical step, dimension door, or a similar ability, you can still take a standard action during your turn. Furthermore, you provide flanking from the square you started in and the square you end in when using these abilities until the end of the turn. You can flank an opponent with only yourself using this ability. This ability had several typos and was also edited for clarity; it should not function any differently than it did before. — Replace dimensional door with dimension door. » You gain the ability to inspire courage in your allies as if you were a bard of ½ your binder level. This benefit stacks with any bard levels you possess. You have a number of daily rounds of inspire courage equal to your binder level + your Charisma modifier (minimum 1); if you possess the inspire courage class feature, add ½ your binder level to the total number of rounds of bardic performance that you possess instead. These rounds can only be spent on inspire courage. Added a line about what happens if you already possesses inspire courage. » You can delay the onset of a single attack, spell, or similar harmful effect for 1 round as an immediate action. This ability can delay the onset of poison, damage dealt by a weapon, or all effects of a spell, including death effects. If the effect being delayed by this ability affects multiple targets, it is delayed only for you. When this round has ended, the effect cannot be dispelled, reduced, or otherwise prevented. After using this ability, it becomes expended for 5 rounds. — Dark Blood’s minor granted abilities have been shuffled into the following order: Disguise Granted Abilities, Rakshasa’s Rage, Read Mind, Silver Tongue. » These rounds do not need to be used consecutively. » Once established, the bond remains until your pact with Vodavox ends. — In the final sentence, replace exhausted with expended. —Replace wall of water with wall of ice. This spell is a 3PP spell and the intent was to stick with material from Paizo Publishing for this book. This was totally my bad, and if GMs want to continue to allow Wall of Water, that's okay by my book. — Mare Loviatha’s minor granted abilities have been shuffled into the following order: Burden of Guild, Dark Horn, Mare’s Whispers, Mounted Prowess. » You gain the benefits of the Mounted Combat and Mounted Archery feats. » You gain the summon shadow class feature. Use your binder level as your shadowdancer level to determine the shadow’s abilities. This ability replaces shadow conjuration. This ability does not correctly adhere to the structure set by other Vestigial Companions. It functions exactly as it does currently. » As a standard action, you can fuse the flesh of a creature within 30 feet, forcing it to make a Fortitude save and a Will save. On a failed Fortitude save, the creature suffers 1d6 points of ability damage to its Strength, Dexterity, or Constitution and becomes entangled. On a failed Will save, the creature suffers 1d6 points of ability damage to its Intelligence, Wisdom, or Charisma and becomes confused. These conditions last for 1d4 rounds. ability using this ability, it is expended for 5 rounds. This granted ability was missing its range and the conditions were missing their duration. In addition, the ability was a little confusing as it was so it was rewritten for clarity. Finally, the "permanent except for break enchantment" was removed, partially to make it less irritating for players to fight Portenta and partially to make room for the other changes listed above (Portenta is a very tight spirit currently). » A creature that fails a saving throw against fuse flesh suffers ability damage to two ability scores of the appropriate type. Simplified to make more room for the above changes. » You can create a double of yourself as a standard action, granting you two turns during each of your turns. Your depletable resources, such as spells per day, hit points, and ability scores, are shared between you and your double and your double has a quasi-real version of any weapons or armor that you are also wearing that cannot leave the double’s possession. You cannot use this ability while you are fatigued or exhausted and your double vanishes after 1d4 rounds. After using this ability, it is expended for 5 rounds and you are exhausted for 1 minute. I got a lot of confused messages about this ability, mostly because it was a lot of book keeping for a Major Granted Ability, so it was rewritten to be simpler. Effectively, it lets you take two turns during each round for 1d4 rounds but you become exhausted after using it. » After using split the twins, you are fatigued for 1 minute instead of exhausted. The old capstone was invalidated with the changes made to Split the Twins. » You gain the benefits of the Dazzling Display feat, except you can use this ability as a standard action. Alternatively, you can replace the first attack that you make during a full attack action with a Dazzling Display. » This ability functions as the Turn Undead feat, except as follows. You do not need to expend uses of channel energy to use this ability and your cleric level is equal to your binder level when using it. This ability affects animals and humanoids instead of undead and a creature that succeeds on its Will save against this ability, it is immune to it for 24 hours. Rewritten for clarity; added cleric level stacking and the note that you do not need to expend uses of channel energy. » You can transform the corpse of a creature that has been dead for no more than 1 day per binder level you possess into a vile husk of itself; this functions as simulacrum, using your binder level as the caster level. The simulacrum is formed from the dead creature, destroying the corpse. You may only possess one vile husk at a time, but you may replace a destroyed husk with a new one if it is destroyed unlike most vestigial companions. This ability replaces troll shape. I have a feeling that the change to Essek Avix's Major Granted Ability is going to need some work (its still sort of long and confusing), so I'm hoping to hear other's opinions on that. Still need to think about if this is the best way to describe this ability's function. The morale of the story is: Don't write errata at 3am. I would write at 3 am, but that's just cause my work schedule. Well, the first thing that I'm thinking is that the ability doesn't really NEED to have the line about alignment. That's more flavor than game mechanics, and if we have to drop it, we drop it. Players would be encouraged to roleplay in the spirit of either the original wording or without it. You can create a double of yourself as a standard action, which possesses the same abilities and equipment that you do. Depletable resources, such as spells per day, hit points, and ability scores, are shared between you and your double and your double’s equipment is quasi-real and cannot leave its possession. Your double can use your granted abilities, but doing so depletes their daily uses and incurs their expenditure for you as well. After using this ability, it is expended for 5 rounds. "As a standard action, you create a double of yourself that possesses the same abilities (including racial features, class features, Hit Dice, etc.) and equipment (including magical gear - save that only it can use its equipment). You share your depletable resources (such as spells per day, hit points total, ability scores, daily uses of abilities, magical item charges, etc.) with your double. After you have acted on your turn, your double can act, with the same limitations and restrictions on actions as a normal creature of your type. Your double can use the same resources as you, but doing so reduces the daily uses and incurs their expenditure for you as well. After four rounds since you have activated this ability, the double ceases to exist, and you cannot use this ability again for five rounds." It is a bit longer than what you have writen but I imagine that it clarifies better its type, exactly what it can and cannot do, and prevents abuse of utilizing magical items with uses/charges (such as a ring of wishes or any magical stave). Of course, you may want to clarify whether or not the double itself is vulnerable to spells like dispel magic or anti-magic field, if the double is actually similar to a summoned double and not a created double (akin to a conjuration [creation] spell) or a construct with a limited lifespan (four rounds). I hope that helps with clarity/simplification. Some very nice thoughts, CB! As a standard action, you create a supernatural double of yourself that possesses the same abilities and equipment as you, including racial features, class features, Hit Dice, and magical equipment. You and your double share all depletable resources such as spells per day, hit points, ability scores, daily uses and charges of abilities and magic items, and so forth and using a major granted ability incurs its expenditure for both you and your double. Your double's items and equipment are not real and vanish if removed from its possession unless fired or thrown as part of an attack, including items it drops or is disarmed of. After you have acted during your turn, your double acts with the same limitations and restrictions of a creature of your type. Your double is a supernatural entity that exists for 4 rounds. Any effect capable of negating or suppressing a supernatural ability has an equal chance of destroying your double entirely. After using this ability, it is expended for 5 rounds. It looks good to me. Up to the rest of the fine folks here to take a comb over it and see if there is a loophole that somehow snuck by. ;) I honestly cannot see anything other than an antimagic field or a dead magic field that can suppress/negate it since it is a supernatural effect. A thought just occurred to me though. How does this ability address issues such negative energy or conditions that last beyond the four rounds? For example, let's assume that the double failed its save against an energy drain spell. After the four rounds has elapsed, does the negative levels carry over to you (similar to what happens to a synthesis summoner when his eidolon gets dismissed) or simply goes away because the original target (the double) is no longer in play? Are all "conditions" or penalties (or other modifiers, such a moral bonus that your double received from one of your allies) of any kind treated the same way? Maybe just split the HP between the original & the double? Or, does the double just have it's own HP count that equals the user's at the time this ability is activated? Also, I'd let those conditions that he double got tagged with fade with the double. Saves on tedium. Basically its supposed to be same soul, different bodies. Anything that happens to one happens to the other. That's the balancing factor. That's why it can last for 4, non-random rounds. Because if you get caught in a dragon's breath weapon while its active, you could take double damage. If your double succumbs to poison, your Con is going down. Having two characters that are forced to share every aspect can be as much of a downside as it is a boon. The only thing that isn't "doubled" so to speak are creatures granted by class features. So if you're a summoner with the upcoming pact magic summoner archetype, your eidolon isn't getting doubled when you use this ability. However, I need to figure out how much room we have on Essek Avix's page before doing much more with this; I need to make sure that there is still room on the page. I see... I should probably be thinking of a good way to attach the errata to the print version for when I need to break out the physical book. Any Update on Volume 2 yet? The Stars are growing right. The Hour of the Beast is at hand. And secrets long forgotten will consume you. 1) Vestigial Companions - you share your granted abilities with most of them (both Major and Minor.) When a companion uses one of your granted abilities, do they use their Cha score and Hit Dice to set the save DC, or yours? 4) Do you have to concentrate to maintain Muse Istago's Major and Persistent Images? Or do they simply last for the duration of the pact? And how long is his Permanent Image meant to last? 5) What is the maneuverability of the flight granted by N'alyia's hybrid bat form? I went with a were-bat (average) because I think it was the closest, but the text isn't clear. 6) N'alyia's charm becomes very weak over time. Any chance of upgrading it to Charm Monster, or at least Dominate Person instead of Charm Person? 7) The blasts given by Cave Mother, Aza'zati, Vodavox etc. are... pretty weak, to be perfectly honest. May I ask what the design rationale was for making them 1d4 every 2 levels? For even a normal spell that's a bit low, and when you add in the fact that these blasts have a 5-round cooldown AND allow a saving throw, it's a bit untenable. When you look at similar blasts from Tome of Magic, e.g. Amon's fire breath, you at least get d6/level even if it still has a 5 round cooldown. On the blasts thing, they may need a boost with the Invoker(a pathfinder Warlock by Little Red Goblins. Overall, it's a decent class. Better than 3.5 warlock) being a thing that exists & the Spheres of Power(an alternative magic system that's being developed right now). With pact abilities having cooldown & other sources that have at will damage effects with the same die progression, it would be best to just boost the damage dice of major abilities to 1 die per level. So I'm finally getting the chance to play an Occultist in an upcoming game... Any update on volume 2? I ordered a couple of days back but apparently failed my perception check to notice that it is on backorder. Alexander, any idea on when more might be on the way to Paizo? Also, any chance that the print version now includes the errata you posted up-thread on June 24th? Yours. Its exactly like the familiar's share spells ability, except it applies to granted abilities instead. I'll get back to you on that; not sure off of the top of my head. That doesn't sound right, though. No. One is better if you're good at skill checks, the other is a flat Will save DC that scales with your level. They function exactly like the spells of the same name, but all illusions should end when your pact with Muse Istago ends. If that's not in the book, I'll plug it into the errata Dario and I are compiling. If I didn't specify, use (average) because that would be a +0 bonus on Fly checks. Keep in mind that the Tome of Magic uses a different scaling than we did; Dario and I designed our spirits under a 9-level progression while Tome of Magic is an 8-level progression. When designing the book, I wanted to make sure that occult spirits were worse than arcane magic and divine magic in some areas. Generally speaking, occult spirits aren't strong healers or area attackers. This is heavily reflected throughout the book. More than anything, its a balance issue. I wanted occultists to be a viable option for players, but I also didn't want GMs to worry about occultists replacing wizards, clerics, or any class, really. You can argue about whether or not the archetypes are too powerful, but these restrictions on spirit power keeps the occultist in a strong niche; one of supreme flexibility at the cost of specialization. My group would make more use of this if there was Hero Lab support available. Are there any plans to do so? You could sell the relevant Hero Lab files. HeroLab is something Dario and I would like to do, but we have no proficiency in the skills required to create those files. Serapith's Scouring Light currently does not affect undead (since it is an effect that has a fortitude save and does not affect objects.) Was this intended, and if not, are there plans to errata it to harm undead? 2) Serapith's Wrath of Daylight blinds affected targets permanently. Will this last after his pact is concluded? 3) Can Selective Ability be used to shield allies from this effect? Currently it only works on major granted abilities, so it does not help as written, but I think it would be okay to extend Selective Ability to minor abilities as well. 4) Mare Loviatha's Burden of Guilt: what action, if any, does the target use hurting itself? Free Action, Swift Action, Move Action, Standard? 5) Jayna Warlock's Ceremony and Sign: what exactly does "void element" look like? Hrm, I would have wanted it to harm undead, but you're right; as written, it certainly doesn't. Flavor it as such: Serapith doesn't care about the undead because they don't have souls; they're already damned, so to speak. He's more concerned with killing humanoids because if they make the wrong choices, he believes their souls will go to the Lower Planes and fuel the demonic, daemonic, and infernal hosts. Basically, Serapith is an Angel with the attitude of a Quipploth. As written, no, but I think that's a fine house rule. I think its a standard action; it was designed with the same wordage as terrible remose, from Ultimate Magic. That's for you to decide; I see it as inky-black nothingness with fringed with purple light, personally. If you have Paizo's Dragon Empire Primer, there's an awesome picture of a Wizard casting a void spell that looks similar to what I'm describing. Excellent! Thank you so much for your responses. I definitely agree on Serapith's outlook. 1) What type of saving throw is required for Musha'vadu's Shadow Storm? (Fort, Reflex or Will?) It says "A successful save reduces this damage by half" but doesn't appear to specify which one. 2) When the Capstone Empowerment causes the shadows to linger for 4 rounds, do they continue to damage creatures in the area, or is it simply an area of deeper darkness with no other effects? 3) Portenta's animal companion is any animal (DM's choice) and says it works as though the animal was the target of an awaken spell. But the awaken spell actually says that awakened creatures can't be animal companions anymore. Can we ignore that line in the spell for the purposes of this ability? 4) What is the activation time of Young Kiros' Fate's Whisper ability? As an unspecified supernatural ability it should be a standard action, while the sending spell it uses takes 10 minutes to cast. I think it should be a standard action so you can deliver the debuffs with it during combat. 5) How far in advance can I spend a "mote" from Daeminthos' Psychic Foresight? For example, if I got three motes in the morning, could I spend each one on a different saving throw and have my next one of each of those saves be boosted, or do I have to spend a mote before actively making a check, like an attack roll or skill check? 6) Are the psychic motes discharged after I make the check they are modifying that day? For example, if I chose "attack" and spent one mote, would only my very next attack get the bonus, or all of them that day? 7) Can the spells from Jayna's Wish be used to craft items, e.g. wands or scrolls? 8) What is the duration on Furious Strike? Does it last until the pact ends, until the target is dead, for 1 round, for 4-5 rounds, or something else? 9) What counts as an "attack" for Furious Strike? Could I add it to a granted ability that doesn't use an attack roll (like Aza'zati's cone or Mutaros' lightning)? And if so and I add it to an area attack, would it only do the bonus damage to one enemy, or could I designate multiple victims? 10) Concerning Pact Poltergeist: If you have multiple spirits bound, can you create multiple poltergeists or only one? 11) If you “download” a spirit into an object, does that free a slot on you to pact with a replacement? Is it possible to have 4 spirits in the Occultist and one in a poltergeist object? Or does a spirit count against your limit even while it is inside an object? 12) Can Exorcise Spirit be used on yourself to end your own pacts without taking the Expel Spirits penalty to binding checks? 14) If you form a pact by using Scribe Binder Tattoo, do you still need to carry out a spirit’s ceremony, including any items? For example, if I have Vandrae’s seal tattoed on me, do I still need to drink spider venom? Again, thanks for all your help and happy holidays! Keep'em coming; an errata/update on this book is on Dario and my list of things to do. Like that. That's an excellent error to catch. Based on the nature of the effect, a Reflex save feels right. The later. The area affected by Shadow Storm becomes an area of deeper darkness for 4 rounds. Yes. Portenta's granted ability is an exception to the rule and only serves to note that your companion has a very high level of intelligence. As I mentioned in your Giant in the Playground thread, the best "flavor" to use is that while it is intelligent, the animal's very essence is still intrinsically tied to your soul, so it progresses with your level. I would roleplay the animal with a haughty, seer-like personality personally. As a general rule, if a granted ability specifies a spell and does not specify any modifications to an aspect of that spell, it uses the spell's normal specifications. In the case of Fate's Whisper, yes. It requires 10 minutes to use. Fate's Whisper is not designed to be a combat ability; it is for ambushes and causing mayhem. You spend the swift action when the roll is made and the bonus applies immediately to that roll. I'll see if I can clear up the language in the errata. One roll, one mote. Think of them as ki points; ki points don't hang around after you use them. Again, I'll see if I can clean up the language. No. Her abilities are supernatural effects. The Magic Item crafting rules do not allow you to use supernatural abilities to fulfill a spellcasting requirement. It should be "until the end of the round." The ability is extremely unclear about that, isn't it? I'll see if I can clarify this feat better in the errata, but for now, let's say its any weapon attack or granted ability that deals hit point damage to the target. Expect this to change in the errata. The intent was to allow you to have as many pact poltergeists as spirits you could bind, but pact poltergeists counted against the total number of spirits that you could seal a pact with at once. For example, if I can normally bind three spirits, I could have three spirits and no poltergeists, two spirits and one poltergeist, one spirit and two poltergeists, and so on. Currently, the wording is dubious and some interpretations are grossly overpowered. Expect this to get toned down, if only so you don't feel like you HAVE to deal with an animated object in order to be an effective occultist. I suppose so, but that's pretty cheesy; it wouldn't fly at my table. Exorcising a pact poltergeist effectively destroys it. Yup. The tattoo only allows you to ignore the requisite of creating a seal.